Infections put you and your family at risk for a life-threatening condition called sepsis. 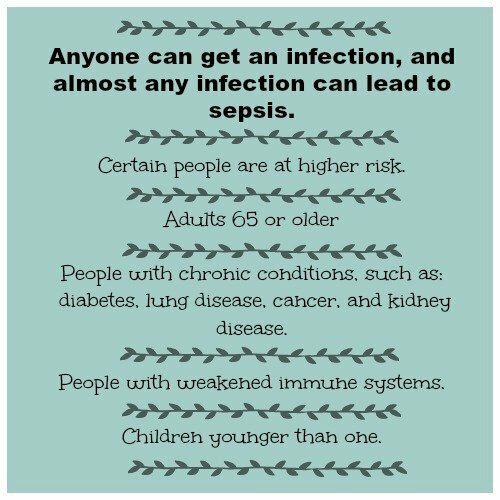 Anyone can get an infection, and almost any infection can lead to sepsis. Sepsis is a topic that is close to my family because we lost my Father-In-Law to sepsis a few years ago. A few years ago, my Father-In-Law, at the age of 72, was hospitalized with some medical issues. He was in the hospital for a few weeks, in a city about 8 hours from our home. We spoke on the phone with him daily and had family members who lived in the same city checking in on him regularly. Based on our phone conversations, we felt like he was improving. In fact, he was due to be released when—very suddenly—things took a turn for the worst. He developed all of the signs and symptoms of sepsis. He was quickly moved to the ICU and we were called to come immediately. We packed up all three kids in the car and were out of the house within 30 minutes, making the 8-hour drive in under 7 hours. As we were traveling along the highway, the Infectious Disease Specialist in the ICU was calling us on the phone. They were frantically trying to determine what specific type of infection was affecting him so they could best treat it. They needed to confirm specific drug allergies and interactions, medical history, etc. Unfortunately, by the time we arrived at the hospital, he had passed. It was a very tragic situation but it taught us firsthand how important it is to know our loved one’s medical information and the signs and symptoms of sepsis so that early recognition and timely treatment can take place. I write this story not to scare you, but to encourage you to take the time to educate yourselves and your loved ones about sepsis. I hope none of you are ever in the situation where you need to use this information, but should you find yourselves there, I hope this story is valuable to you. In our immediate family, I have one son on the Autism Spectrum and he also has a variety of other health issues. Another son developed RSV as an infant and continues to struggle with health issues as a teenager (more on that in a moment). My third son has ADHD, but no other health issues. I have an autoimmune disorder, and some of the medications I take make me more susceptible to infections, so I keep a close eye on things and stay in communication with my physicians when I am sick. We are all fully vaccinated because we have chosen to take every possible action we can to help prevent serious illness and infections. My middle son who had RSV tends to get very sick very quickly from illnesses. We’ve had to make several Emergency Room visits when fevers spike very high, or signs and symptoms seem to be progressing instead of improving. Just this past year, he was hospitalized with pneumonia when his first course of antibiotics did not show improvement after 72 hours. We were fortunate that the IV antibiotics he was given at the hospital helped him turn the corner quickly. Many other children on our floor had to be flown to larger hospitals in Boston for more advanced treatment. When a family member is sick, it’s important to document signs and symptoms and treatments taken. The doctors were thankful that I brought a record of every temperature taken, medication given, and other signs and symptoms exhibited, because it helped them quickly identify what was working/not working, and not waste time repeating previous treatments. As caregivers, you also want to be proactive and not reactive, whenever possible. Do not worry about bothering a nurse with a question, asking a doctor to further explain anything you don’t understand, requesting a second opinion, or take any other action needed to help your loved one as they recover from illness. Wash hands frequently, ensure others are handwashing as well, make sure gloves are used when appropriate, and any gowning up that is necessary is done. The CDC has launched a new initiative, Get Ahead of Sepsis, to help us know about the importance of early recognition and timely treatment of sepsis, as well as the importance of preventing infections that could lead to sepsis. Recently, I have had two friends, both in their early 40s, hospitalized with sepsis. My first friend had a simple ear infection, went to the doctor for an antibiotic, and after 48 hours it was significantly worse instead of better. She works at a retail pharmacy so she is exposed to those who are ill frequently, but she takes careful precaution to prevent infections by washing her hands frequently, disinfecting surfaces, getting recommended vaccines, and consulting with her physician right away when she becomes ill so they can discuss treatment options. For the signs and symptoms of this infection, they determined an antibiotic was necessary, and she made sure to get plenty of rest and fluids. When she noticed she was developing the signs and symptoms of sepsis, she went to the Emergency Room right away. My friend was clammy, feverish but cold, having trouble catching her breath, and her heart rate was very high. While in the ER, she became confused, and the medical personnel did lab tests, then diagnosed her with sepsis. They were able to call in an infectious disease specialist right away, get her admitted, run tests, and get proper antibiotic treatment underway before the sepsis could progress further. My other friend has a chronic medical condition and has a weakened immune system, so she is in the category of those at higher risk. My friend is very sick and still in the hospital, but was fortunate that her physician recognized that she was exhibiting sepsis signs and symptoms right away and sent her to the hospital to be immediately treated. I cannot repeat this often enough: Sepsis is a medical emergency. ACT FAST. Get medical care IMMEDIATELY if you suspect sepsis or have an infection that’s not getting better or is getting worse. (Sepsis Awareness #GetAheadOfSepsis) Wow! I was just reading a whole section on this subject just last night which was mentioned in a artical that I was reading on Lupus , which I believe I have. I am going to make a doctors appointment in Freeport, IL. to get the correct diagnoses to all this pain that I have been having in my joints. In the section that I read Sepsis was brought up. Thank you for sharing this very important information! This could save someone’s life one day! 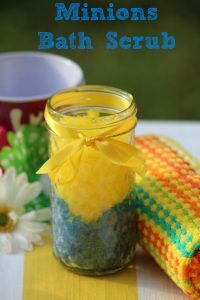 This was a very interesting and informative post! I appreciate the heads up. My mom went in to septic shock a few years ago after her doctor’s office neglected to inform or treat her for a UTI they diagnosed her with several months prior. Thankfully I went with my gut and took her to the ER when she was shaking and vomiting, even though she said she didn’t want to go. The home thermometer wasn’t reading as a fever, but when they took it in the ER it was over 105 degrees! She would have probably died if I let her just go to bed like she wanted to do! So scary! This is a very good and important post for people to learn about sepsis!! My sister was just in the hospital after a simple ear infection turned septic. She thought she’d get over the infection without antibiotics and put off going to the doctor. Once it got more serious, it went downhill very fast. While it’s important not to take too many antibiotics, it IS important to let your doctor make the choice about when it’s necessary or not, and to let them manage your care. My sister is recovering slowly, but like the others who’ve shared, we are so very thankful that we were able to get her to the ER in time for it to be treatable. She felt silly at first going to the ER with an ear infection, but thankful when she discovered it was more serious than she’d realized. I’m printing and sharing these tips with others because you never know when they’ll save someone’s life!!! I actually just faced sepsis myself. I had pneumonia and was incredibly sick. I ended up in the hospital as the infection was in my bloodstream. It is amazing how quickly sepsis can occur. Sepsis is very scary. EXCELLENT advice to act fast, it’s better to get checked and be wrong than to wait too long and not be able to treat it! Sepsis is so terrifying. This is a great post because most people wouldn’t know what to look for. This is so helpful! I too lost someone to Sepsis, from a simple infection. Sharing now! This brought me a lot of new info! I hadnt even ever heard of sepsis until now! Thank you for this important information on sepsis! It is so important to know the signs and symptoms of sepsis , and to understand that it is a medical emergency and to seek help right away! I work in healthcare and know just how life threatening sepsis can be. I agree with you that people need to be more aware. I know plenty of people who don’t even know what sepsis is and others who know about it but not what to look for. My step-father developed it in his infected toe over christmas 6 yrs ago – it lead to his losing the bottom half of his leg. I always urge people to keep an eye on infections and get to a Dr when it looks weird. This is so scary. I dread when a family member has to visit the hospital or stay there. There’s so many things you can get like sepsis. My cousin died of MRSA which is a deadly infection after going to the hospital for something else. So sad.